Another regular season, come and gone. We have a first-time regular season champion! Congratulations to gr8ness97 for claiming the regular season title! He started the year with a loss, and has reeled off seven straight to become the #1 seed going in to the playoffs. A reminder that EVERYONE PLAYS THE ENTIRE SEASON. Everyone is in the playoffs, and nobody gets eliminated from the playoffs. We have three weeks left, and EVERYONE plays the next three weeks, even if you lose. gr8 already had the title wrapped up, even with a loss, but he hit right near his season average to take the victory anyway. Five of his six players scored 22+ points, led by QB Bryce Witt's 34.45 points. He even benched his two highest-scoring players, as QB Jayru Campbell (46.45) and RB Cameron Mayberry (41.8) rode the pine to victory. My team was garbage all around. I did have the highest-scoring starter of the match-up, with QB Cordelral Cook scoring 37.5 points, but only had one other player score over 20 points, and had three players in single digits. The kid took the victory in position week to earn the #2 seed in the playoffs. NSM got 56.8 points from RB Walter Fletcher, who had 328 yards and 4 TD's rushing, the second-highest scoring performance of the weekend, and he alone was nearly enough for the win. MM only had one player score over 20 points, and his highest scorer was on the bench in QB Isaac Harker (32.8 points). RC benefited from not only the single highest-scoring player in the league this week with RB Gabriel Watson, who scored 62 points with 320 yards and 5 TD's rushing, but he had two CWU guys score over 35 points, as they set a school and GNAC record for total offensive yards. His 35.2-point benching of RB Marc Jones didn't matter. Ian got 44.6 points from QB Lenny Williams, who had the rare 100-yard QB rushing performance, but just couldn't keep up with the firepower from RC. ship had two players in the 30's, led by QB Amir Hall's 32.2 points and RB Wes Hills' 31.5 points. 08LB had two zeroes in his starting lineup, but had three players score over 25 points on the weekend. 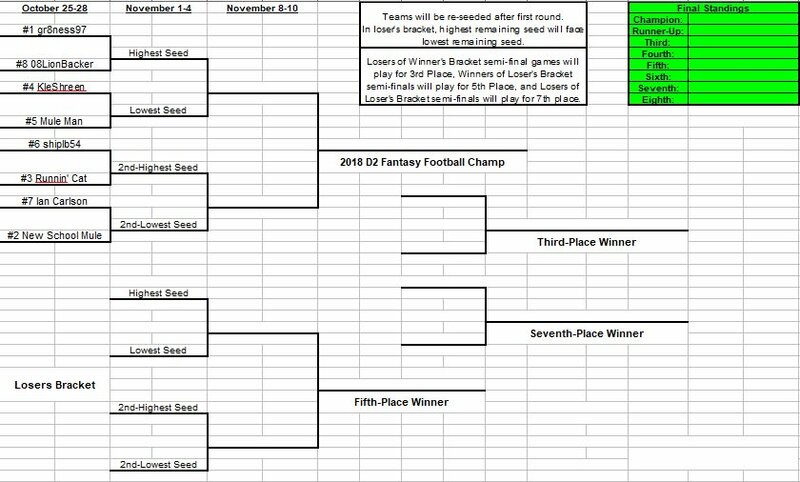 And here is what our starting playoff bracket looks like. A reminder that teams will be re-seeded after round one. So the highest-remaining seed will face the lowest-remaining seed in round two. We don't have anyone in the league playing on Thursday, and I don't think anyone is going to pick up any players from either of the teams playing Thursday. So our deadline to submit lineups this week will be Saturday, October 27th, at 11 a.m. Eastern. You guys all know the drill. Please clearly mark your starters and bench, with your starting lineup consisting of 1 QB, 2 RB, 2 WR, and 1 RB/WR flex spot. Please make sure to pay extra attention to opponents. We had a player on a bye who was submitted in a starting lineup last week despite another player at his position being available to take his spot. So make sure you are looking. That's what I put it all there for. Thanks! Last edited by KleShreen; 10-25-2018 at 06:52 PM.